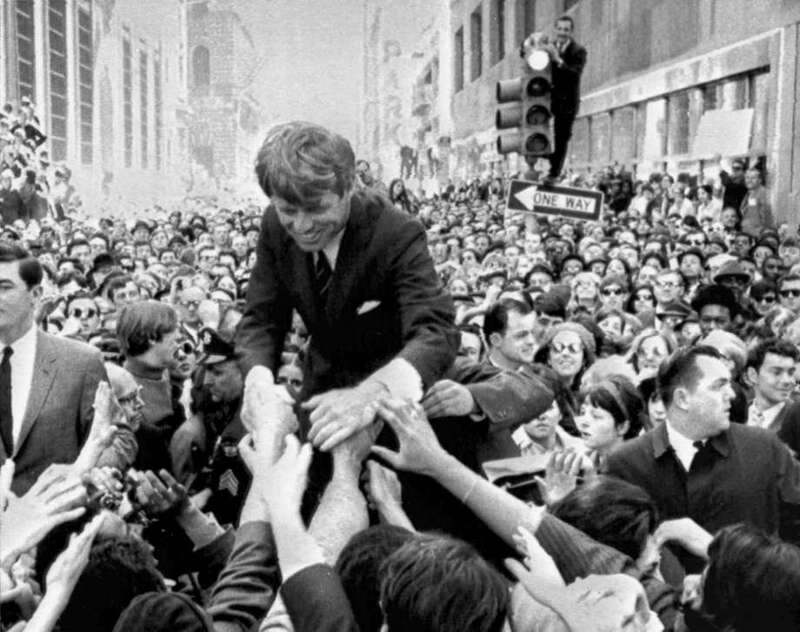 FILE – In this April 2, 1968 file photo U.S. Sen. Robert F. Kennedy, D-NY, shakes hands with people in a crowd while campaigning for the Democratic party’s presidential nomination on a street corner, in Philadelphia. Friends and family of U.S. Sen. Robert F. Kennedy will host a memorial service at Arlington National Cemetery on June 6, 2018, to honor him on the 50th anniversary of his assassination. On Wednesday, June 6th, we recognize one of the most tragic and calamitous events in American history: that 50 years have passed since the assassination of Senator Robert F. Kennedy. Many Americans like me are sustained and encouraged by great historical figures, whether living or deceased. Mine are the usual and deserving suspects: Lincoln, Eleanor and Franklin Roosevelt, Gandhi, and King. For me, I add among these esteemed individuals the late Senator Bobby Kennedy. I was only 4 years old when Robert Kennedy was killed. My personal connection to him is one of shared values, though I had the honor of meeting with his eldest child, Kathleen (then, Maryland Lt. Governor), at a Maryland Democratic Party event. Senator Kennedy’s short life was a complicated one. Prior to his selection as Attorney General beginning in 1961, his professional life is regarded by liberals and progressives as uneven. Kennedy is seen as driven for familial success first, and personal success second, with a tendency to see the world in black-and-white. Kennedy worked with Senator Joe McCarthy as counsel to the Senate Permanent Subcommittee on Investigations. According to a recent treatment of Kennedy’s life, “Bobby Kennedy: A Raging Spirit”, his work was less specifically directed at rooting out Communists in the United States than other work. And he is described as at loggerheads with another McCarthy staffer, the ignominious Roy Cohn (who later acted as a “heavy” for a young Donald Trump). Still, for liberals, the Kennedy connection to McCarthy is not a badge of honor, for sure. Bobby Kennedy later worked for the Senate Rackets Committee, taking on Jimmy Hoffa and perceived corruption in some labor organizations. Again, from a progressive or purist, pro-labor vantage point, even taking on inarguable corruption in labor unions rankles for some. But, in the seven-year span from 1961-1968, with few exceptions (authorizing the wiretapping of Dr. King—which can be seen as a way to placate FBI Director Edgar Hoover), Bobby Kennedy shines. This is first true because of his concerted efforts to promote the goals of the civil rights movement, evidenced by repeatedly supporting the rights of African-Americans to attend public universities and enjoy the benefits of public accommodations, unimpeded. As Attorney General, Kennedy took the side of the angels and he was a loyal and genuine ally. More importantly, it was the death of his brother that caused a pain the likes of which few can know. And from that pain, as Kennedy friend, Harry Belafonte, said, “Bobby’s moral center seemed to stir”. What followed was an empathic journey in support of cures for Americans’ suffering. Native Americans. The poor, generally. African-Americans, some malnourished, living in the Mississippi Delta. The jobless of Appalachia. Migrant workers in California. Bobby Kennedy even confronted South African apartheid before anyone here had much familiarity with it. And, of course, Kennedy perceived the folly that was the Vietnam War. Indeed, more than 50 years before our current American culture’s liberal values were fully developed, Senator Kennedy adopted contemporary views, more progressive than most Americans in the late 1960s could appreciate. There is little daylight between what Kennedy argued then and what America’s most progressive politicians assert today. Again, it was Bobby Kennedy’s own personal suffering and drive to create a more equal, more just society that compelled him to take the positions he espoused. Kennedy’s death was especially brutal—an insult. For me, accounts of his life grow particularly painful as 1967 becomes 1968 and the end nears. And so much of his tragic death stemmed from intractable, American problems that persist today: mental illness, misuse of ubiquitous guns, and his assailant’s purported concern with the plight of the Palestinians. And then there is history, which turns on events, either singular ones or bunches of them. On June 6, 1968, Bobby Kennedy trailed Vice-President Hubert Humphrey 561 to 393 in the delegate count. This, despite the fact that Kennedy had won four primaries and Humphrey had won none, and explainable only by the fact that the 1972 Democratic Presidential Primary reforms had not yet taken effect. Nominees were still mostly selected in back-rooms by the party hierarchy. The conventional wisdom is that Bobby Kennedy was not destined to be my party’s nominee in 1968. However, as Kennedy was taken from us at just age 42, it’s clear that he was a likely presidential nominee in the near term. Sadly, history turned on a single, tragic and especially horrible event. A dashing, intelligent and fully capable person—and most importantly, one with an abundance of empathy for human suffering most of us, fortunately, cannot know–was taken much too soon. My recollection of his life will always be a painful one for me personally. All history’s readers can do is mourn, learn, and press onwards.